Subscribe to YAWP! MM5 forecast for free! Subscribe to a daily YAWP! forecast for free! YAWP! is now offering you a daily forecast for your home town mailed to you for free! If you are a farmer, golfer, manager of a cafe or just wants to be updated with a detailed weather forecast for your home town - this is it! The forecast is mailed to you every morning and gives you a detailed weather forecast of temperature, wind, precipitation, cloudiness and pressure for the current day and until noon the next day. Just fill in the form below with the site for the forecast, between the days you want it to be mailed to you, your name and email address. New is that you can personalize the forecast with your own headline, e.g. your company's name or the street you live in. If you don't want your own headline, just skip this field and the name of the chosen site will appear instead. Click in Submit! 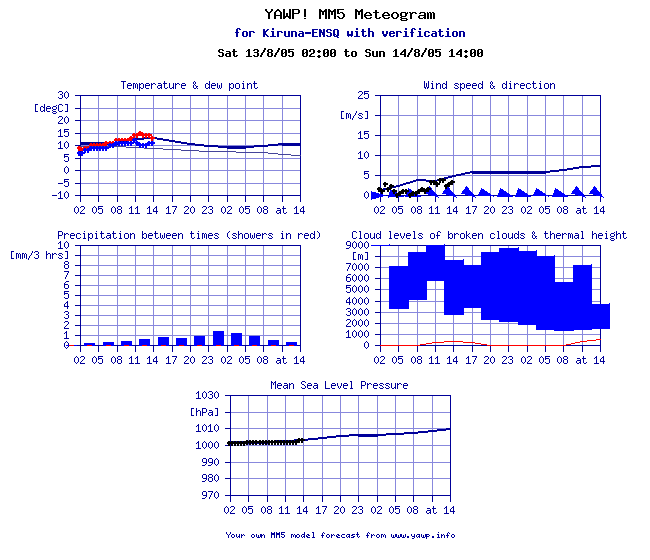 and the forecast will be sent to you as an image file ( a PNG file with size of approx. 145 kB). See below for an example of forecast and a legend how to interpret the forecast (clickable). 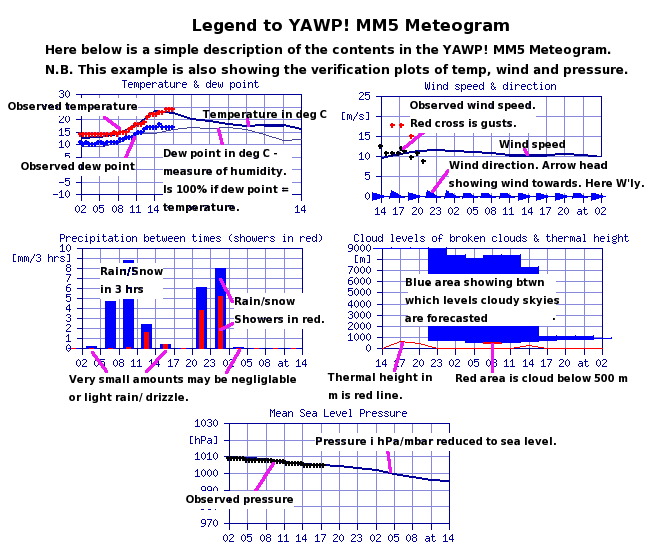 You can also choose to have observations from the same site or the nearest site plotted in the diagrams as verification of the forecast (see example and legend above). Choose then a site for verification in the list in the form below . N.B. By subscribing you agree to that the personal data you entered above is dealt with according to the Swedish Personal Data Act (1998:204).